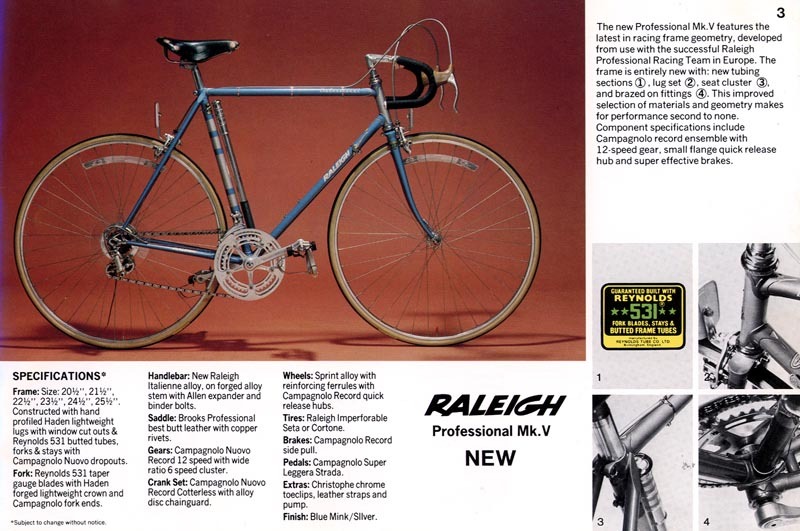 The Raleigh Professional was the top of the line among Raleigh's production bikes. 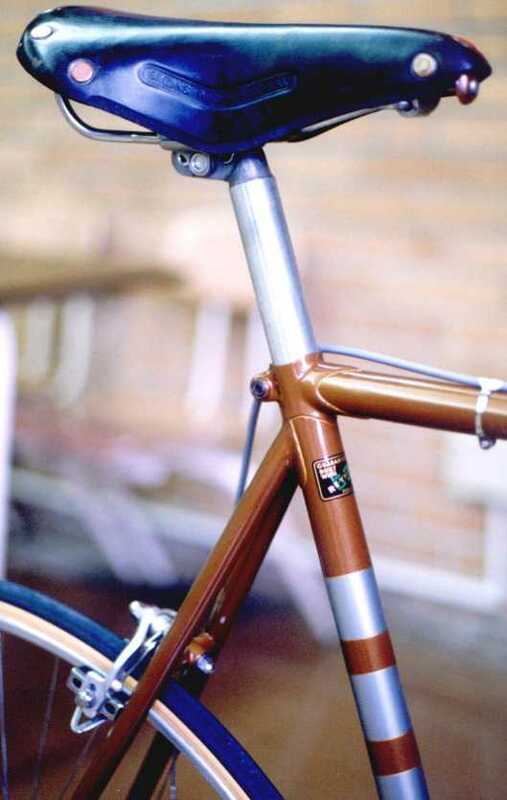 It was in many ways a tribute to the Italian designs of the era, with its elegantly simple lugwork and Cinelli-style sloping fork crown. The "fastback" seat cluster was a hallmark of the earlier Professional. "E" serial number, oval headbadge. Red, black, and orange/yellow bands on seattube, gold stripe decals between bands, oval Raleigh logo decal inside the black band. Gold/brown pinstripes and lettering, "Raleigh" on downtube, "Professional" on toptube. No chrome. Reynolds 531 butted throughout. Cinelli sloping fork crown, prugnat type lugs. Semi-wrap around seat stays with 5 stripes across narrow dimension of the stay caps (red, green, & yellow). Chainstays round at BB, no dimples. Campy or Zeus dropouts with eyelets on rears only. Campy NR throughout except brakes. 52 & 44 tooth chainrings. Brooks Pro leather saddle, possibly Unicanitor unpadded, uncovered plastic saddle. 5-speed freewheel. GB, AVA or Weinmann alloy stem. Plain alloy (36cm c-c) or GB engraved bars. Weinmann rims. Weinmann centerpull brakes w/quick release brake levers. Levers not drilled out. White plastic lever hoods (no "Carlton" in the molding on mine). 3 brazed on cable guides/stops for rear brake. 2 at front of toptube, 1 at rear. 1 brazed on cable guide/stop for rear der cable on top of right stay. 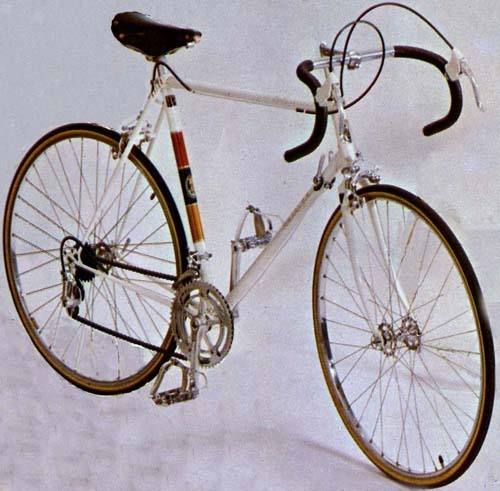 Serial # starts with "F" which according to your page would make it a 71, but bike also had a decal on the seat-tube which said #228 of 500, limited edition. According to Brian Baylis, who did the paint and decal restoration, and information on your page, this limited edition was 1970. I dont know which is right. You can see it is the brownish-gold/silver combination, with heron headbadge. Gold pinstripe lettering, "Raleigh" on downtube,"Professional" on top-tube. "Mark Two" on seat-tube. Chrome on fork crown and lower fork blades. No chrome on rear triangle. Sloping fork crown. 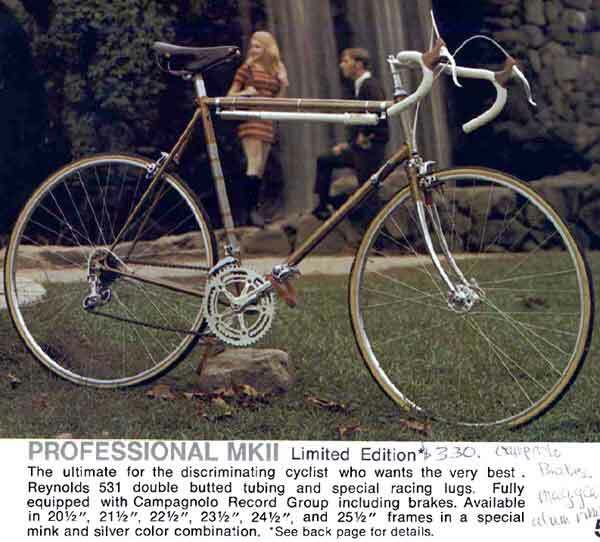 Reynolds 531 db tubing. 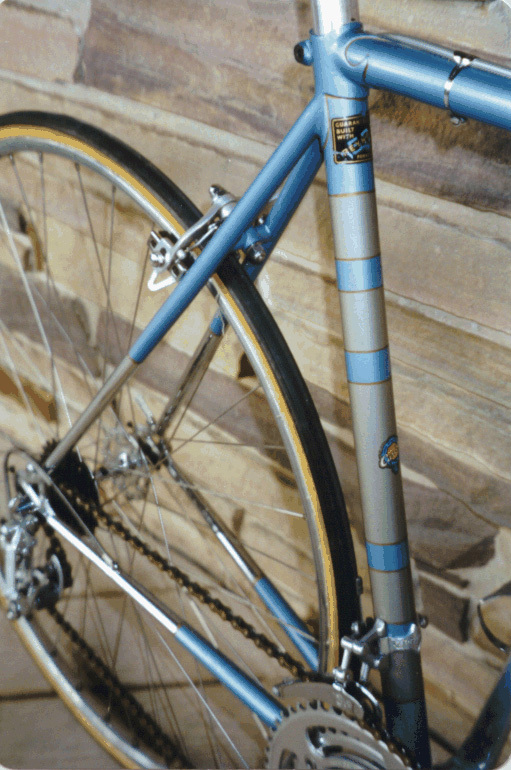 Originally had Carlton "blue ribbon" decals on fork blades (not the typical Reynolds triangles), but according to Baylis, the decals aren't being reproduced anywhere -- we decided to leave the blades decal-less in case they come available later on. Fastback seat lug. 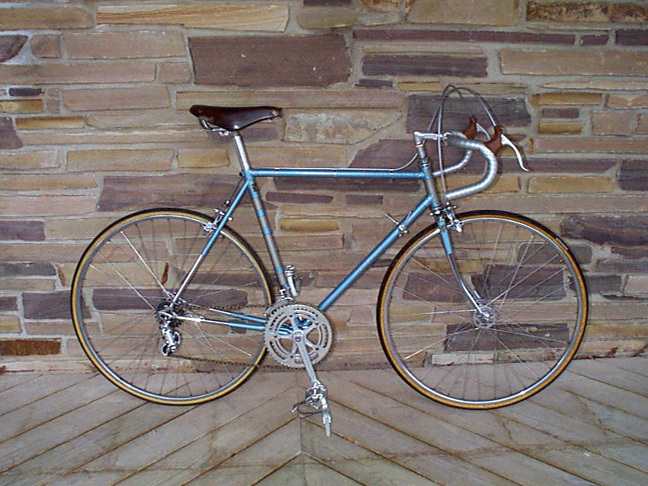 Round chainstays (no dimpling). Campy dropouts with eyelets. Full Campy NR, including brakes. 52x45 crank chainrings, with 172.5 arms, no date markings on arms. Rear derailer says "patent 70". Brooks Professional saddle. 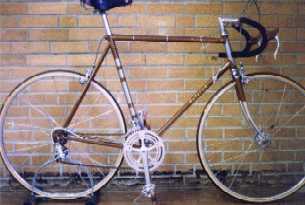 5-speed freewheel, Regina Oro, with Regina Oro chain. Campagnolo "world" decal on downtube, just above shift levers. TTT Record stem, GB engraved bars with "map" of england. Rims are decal-less, but may be Fiamme rims. Pedals are engraved with <c> and have loops for the straps. Christophe toe clips and straps. Clement Criterium sew-up tires. Black Velox bar tape and end-plugs. Campy chrome-steel top tube cable clamps and down-tube bottom bracket cable guides. The following are pictures of this Professional. Each is linked to a larger picture. "G" serial number. Grey headtube and bands on seattube. Gold/brown pinstripe lettering, "Raleigh" on downtube, "Professional" on toptube. Chrome on half stays, half fork blades, and fork crown. Reynolds 531 butted throughout. Cinelli sloping fork crown. Semi-fancy lugs (make unknown). Triangular cutout in the seatpost lug and both toptube lugs. Brampton-Victor "fastback" seatpost lug, allen head seatpost bolt. Chainstays dimpled at BB, both sides on right stay, inside of left stay. 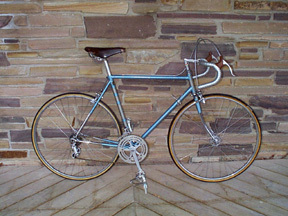 Campy dropouts (without eyelets on US model?, with eyelets front & rear on British model?). Campy NR throughout. 52 & 44 tooth chainrings. "1037 <C>" stamped on pedal body. Brooks Pro leather saddle (small rivets). 6-speed freewheel (13, 15, 17, 19, 21, 24..Cyclo or Atom?). Carlton "belt" decal on seattube and each fork blade. 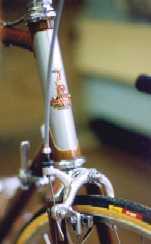 Campagnolo decal on downtube above shift levers. TTT Record stem, recessed allen head on expander bolt, recessed flat round head bolt and hex nut on clamp. GB engraved bars, 40cm c-c. AVA rims. Reginia Oro chain. Campy toptube clamps for rear brake cable. Mine may have been an example intended for the British market that "accidentally" wound up in the US. Lugs are semi-fancy, but not nervex, and are not like any I have seen on other Pros. Triangular cutout in the seatpost lug and both toptube lugs. The eyelets are still on the dropouts. I've heard that Raleigh catered to the US obsession for rediculously minor reductions in weight by cutting the eyelets off the dropouts on bikes intended for the US market. The other domestic Pros that I have seen don't have eyelets. The following are pictures of this Professional. Each is linked to a larger picture. A927C serial (doesn't fit the "system" but RRAs were made in 73 and the serials on mine also started with an "A" and a "G"). Grey headtube and bands on seattube. Slanted white block lettering "RALEIGH" on downtube and chainstays. White pinstripe lettering "Professional" on toptube. Chrome on half stays, half fork blades, and fork crown. Reynolds 531 butted throughout. Cinelli sloping fork crown. Simple pointed lugs (Prugnat?). Brampton-Victor "fastback" seatpost lug, allen head seatpost bolt. "CC" cutout in bottom bracket shell. Chainstays round at BB, no dimples. Campy dropouts without eyelets. Campy NR throughout. 52 & 43 tooth chainrings. "c" in a diamond on chainrings. No "<C>" on bottom cup of headset. Superleggero pedals, "1037 <C>" stamped on pedal body. Brooks Pro leather saddle (small rivets). 6-speed freewheel. Carlton black & gold decal on seattube. Reynolds 531 decal on each fork blade. 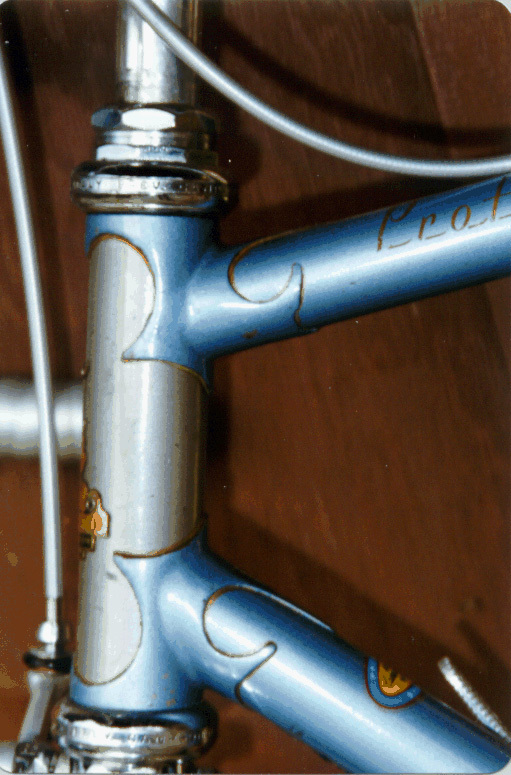 Campagnolo decal on downtube above shift levers. TTT Record stem, allen head on both the clamp and expander bolts. GB engraved bars. Super Champion rims. Reginia Oro chain. Campy toptube clamps for rear brake cable. "A3" serial number. Heron headbadge. 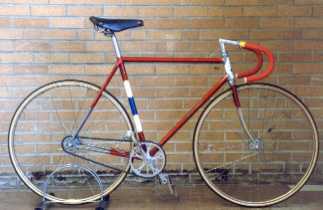 Red, with white and blue panels on seat-tube, gold pinstriping between panels and around lugs. Heron logo decal in center of blue panel. Black and gold slanted block "Raleigh" on downtube and chainstays, "Professional" on toptube in gold script. Reynolds 531 butted tubing throughout. 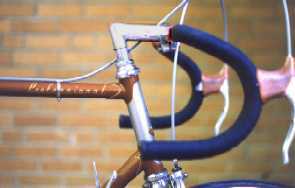 Round-tube forks with flat crown. Chromed half-stays, fork crown, and half-fork blades. Prugnat-style lugs, chromed at head-tube. 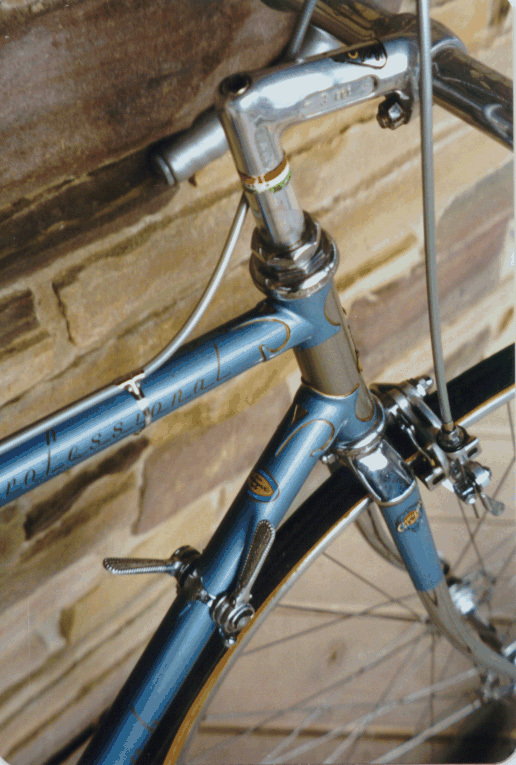 Dimpled chainstays with long-point reinforcing tangs at bottom bracket. Semi wraparound seatstays (nearly touching on seat lug, as on Internationals). Campagnolo dropouts and rear fork ends. Campagnolo Pista component group throughout, ("upgraded" with SR pista titanium-spindle pedals). 48 tooth chainring, Campy 18 tooth steel cog (photo actually shows different rear cog). Brooks Professional saddle. 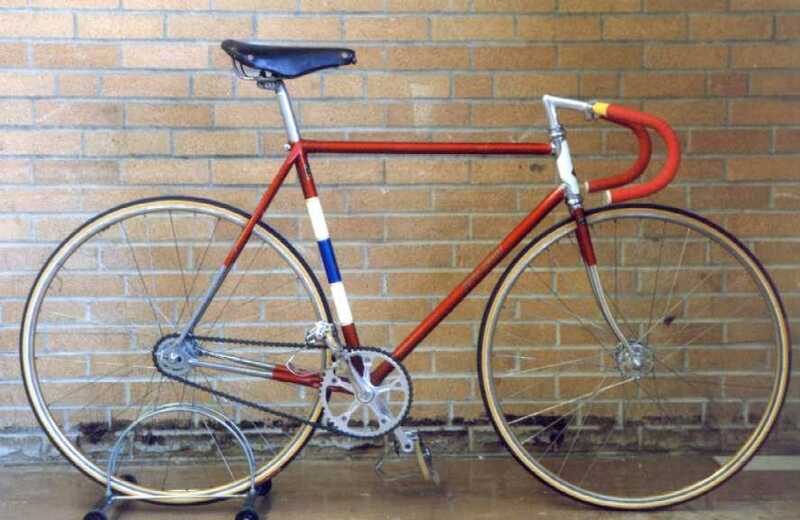 Cinelli pista bars and sloping stem. Gold anodized Nisi Rims with sew-up tires. I lusted after a professional from the first time I saw one in the early '70s, but it took me a long time to find one in my size at an affordable price. I finally got a very affordable mink silver frameset from eBay. 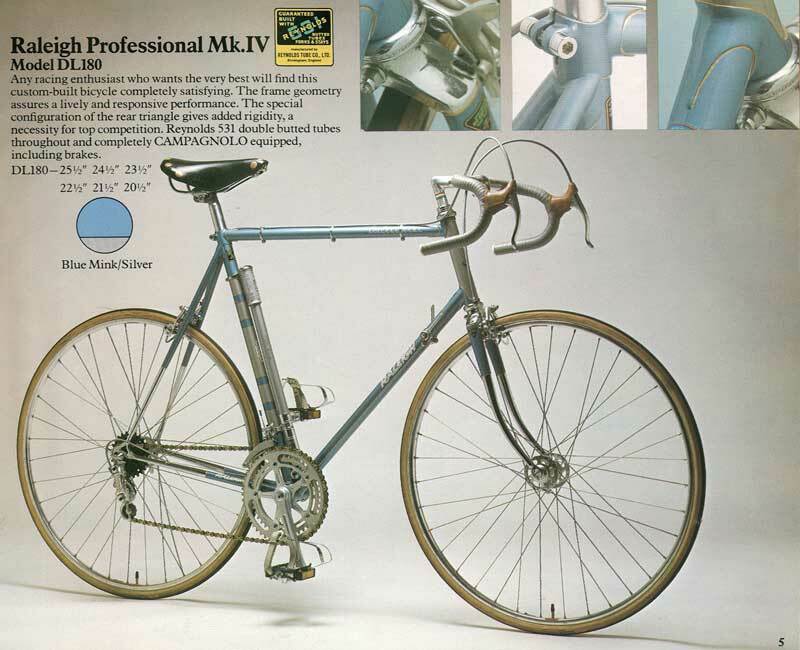 The price was very low because the bottom bracket shell was cracked in the crotch between the seat tube and the down tube. Fortunately, Brian Baylis came to the rescue, and offered to actually replace the bottom bracket! While he had it, I had him repaint it in the colour of the first Professional I ever saw. His "restoration" made the frame better than new, and the paint job has to be seen to be believed. Click here to see photos of this bike. Frame Sizes 20.5", 21.5", 22.5", 23.5", 24.5", 25.5" 20.5", 21.5", 22.5", 23.5", 24.5", 25.5" 20.5", 21.5", 22.5", 23.5", 24.5", 25.5"
with Campagnolo Fork Ends. Pic shows semi-wraparound seat stays with oversized caps. and Bottle Cage Bosses, Chrome Plated Fork Tips Front and Rear. Pic shows silver Silca pump mounted to front of seat tube.